Such a cute photo! I love the coordinating outfits! What a great photo!! they're all adorable! They are just adorable and look so happy! Very fun! I love coordinating outfits. Oh so cute! What a great photo. They are so cute! Happy WW! They are so adorable! Love the coordinating outfits. They are three little cuties. Great pic! 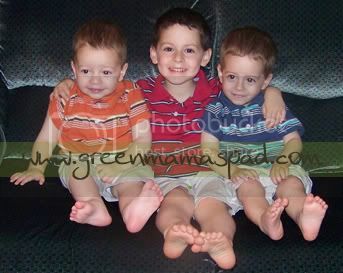 Look at those 3 handsome little guys. Cute! They look so much alike. SO cute! I"m jealous you found such similar shirts. I can never find shirts that look like they belong together for my boys, but they're also 5 years apart in age. What a sweet photo! Definitely worth blowing up and putting on the wall. Happy WW! That is such a cute picture. I love the outfits. Happy WW. Your boys are just too cute!! Great picture!